chichiri no aijin has started back to school as of last week and we are already behind in letters, no da. we're going to close down to catch up and hope to re-open soon. thank you for your understanding, no da! we've joined cdjapan's affiliate program! so click on the link above and check them out onegaishimasu. arigato to gen-chan no miko and synangel for the really cool banners and for the button! you'll find them on our links peeji. check out seishi of the week for our valentine's day picture from us to you. chichiri no aijin has discovered pocket bishounen! *all the seishi sweatdrop* check out the peeji she has created for her "catches" onegaishimasu! our fanart gallery is where we will display all the fanart that we receive. please remember to ask permission of the artist before copying and using any pieces onegaishimasu! and if you are an artist of one of the pieces here and you aren't credited, please let us know so we can give you the proper credit. our letters section is where to go if you want to ask us questions. in this section you can read our responses to recent questions or view the archive of past questions and answers. make sure to visit the suzaku seishi's favorite fushigi yuugi links. make sure to visit the our favorite nihongo learning and general information sites. here you will find links to japanese dictionaries as well as sites on japanese culture. and also make sure to visit our other sites of interest peeji. 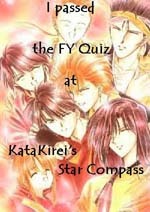 here you will find other things besides fushigi yuugi and japanese sites. do you have comments or feedback on our site? we'd like to hear from you! drop us a note at suzakuseishi@asktheseishi.com. note that this address is only for site comments and feedback. all of the characters and images on our site are copyrighted by their respective owners, watase yuu, shogakukan, flower comics, movic, bandai, studio pierrot, pioneer, and tv tokyo. this site is for entertainment purposes only.